HyperDeck Studio Mini is a portable broadcast quality deck that records ProRes onto commonly available SD cards. You get 6G-SDI for recording all formats up to 2160p30, dual SD card slots for non-stop recording, a built in LCD screen and familiar VTR style front panel controls, all in a design that can be used on the desktop or in â…“ of a standard rack space. HyperDeck Studio Mini also features 720p and 1080p 4:4:4:4 file support with fill and key outputs so it can be used as source to provide broadcast graphics to live production switchers for downstream keying over live video. The Blackmagic Design HyperDeck Studio Mini is a transportable broadcast quality record/playback deck capable of being rackmounted. It can capture video up to 2160p30 thanks to a 6G-SDI input, as well as combining one HDMI and two 6G-SDI outputs. Two SD card slots enable practically endless recordings. Its front panel includes an integrated LCD allowing the user to monitor video, as well as button control and a jog/shuttle wheel for an analogue scrubbing feel. Additionally, RS-422 control is supported for external control. The unit can also be remotely operated using either the USB port or Ethernet via the RJ-45 connector. Blackmagic Design’s HyperDeck Studio Mini is a miniaturised broadcast deck so compact and portable it has potential to be used effectively anywhere. Even at its unbelievably tiny size, you get a professional deck that records and plays back broadcast quality 10-bit video as ProRes files on widely available SD and UHS-II cards. It’s packed with features like 6G-SDI for compatibility up to 2160p30, HDMI 2.0 for monitoring, dual SD card slots for non-stop recording and a reference output with built in sync generator permitting the daisy chaining and synchronisation of multiple decks together. The Dual Link 6G-SDI out can even be used to playback 720 and 1080 HD 4:4:4:4 files to separate fill and key outputs. What’s more, Blackmagic Design’s HyperDeck Studio Mini includes industry standard RS-422 deck control, a built in power supply and ethernet with PoE+ for custom control solutions and uploading media via FTP. 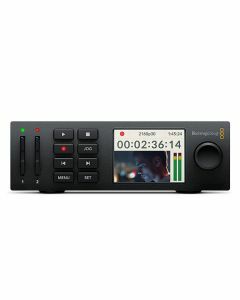 HyperDeck Studio Mini is also ideal for use as a master program recorder during live multi camera production, or as an ISO recorder from cameras, allowing the user to edit the final program later. On top of that, HyperDeck Studio Mini is a powerful clip player for playback directly to air, or as a client preview deck in a conference room with a large HDMI television. Because you can lock and sync the playback of multiple units together, it’s well suited to high resolution digital signs that use multiple screens. The separate fill and key SDI outputs aloow the use of animated broadcast graphics with an alpha channel for keying over live video with a live production switcher, all in real time. The Blackmagic Design HyperDeck Studio Mini features multi rate 6G-SDI connections so you can connect it to virtually any camera, monitor or SDI router and work with all SD, HD and Ultra HD formats up to 2160p30. You get an SDI input, reference input and two SDI outputs that can be used as dual link or fill and key outputs. The high quality HDMI connection lets you play back to big screen televisions, digital projectors and more. In addition, there’s an RS-422 deck control connection, ethernet for uploading files to it via FTP and a built in 110-240V AC power supply. There’s even an SDK and easy to use ethernet protocol documented in the instruction manual that lets you integrate HyperDeck Studio Mini into your custom systems and software. Analog Audio Input: None, embedded audio only. Analog Audio Output: None, embedded audio only. Media: 2 x SD for SD, HD and UHD recording. Media Type: UHS II and able to support ProRes 4444 playback and 422 recording. Media Format: Can format discs to ExFAT (Windows/Mac) or OS X Extended (Mac) file systems. Built-in Control Panel: 8 buttons for menu control, 2.2" color display, and a rotary wheel. Software Included: Media Express, Disk Speed Test, Blackmagic System Preferences and Blackmagic driver (Mac only).